Phage display represents an important approach in the development of specific antibodies for research and other applications. The generation of antibody fragments with high specificity and affinity for virtually any antigen is possible using phage display. The genomic information coding for antibody variable domains is usually derived from B cells of either ‘naive’ (non–immunized) or immunized donors. Construction of these libraries involves relatively straightforward molecular biology techniques such as reverse transcription (RT) of mRNA, followed by polymerase chain reaction (PCR) with germline-specific primers to amplify the Variable Heavy (VH) and Variable Light (VL) gene segments from the cDNA template, and restriction based cloning to incorporate the rearranged antibody segments into an appropriate phagemid display vector. Finally, the vectors are transformed into E. coli cells to generate the antibody repertoire. Phagemid vectors facilitate construction of large antibody libraries which contain the phage coat protein and an antibiotic resistance marker. The antibody fragment is cloned upstream of the g3p or g8p coat protein sequence and expression is controlled by the use of a promoter such as lacZ. The antibody fragment is displayed in a multivalent format, since all copies of the phage coat proteins (g3p/g8p) are translated as fusion proteins. A helper phage such as M13KO7 or VCSM13 is required. The helper phage provides the genes which are essential for phage replication and assembly, including a wild-type copy of the coat protein used for display of antibody fragments on the surface. Selection of specific antibody fragments involves exposure to antigen, which allows the antigen-specific phage antibodies to bind their target during the bio-panning. Target immobilization: the purified target of interest is immobilized in both solid and liquid phases. Solid phase: Antigens are coated directly on a solid surface, such as ELISA plate or immuno tubes. Liquid phase: a biotinylated antigen is coupled to streptavidin-coated Dynabeads®. Magnetic sorting isolates phage which express antibodies that bind to the antigen coupled to the Dynabeads®. Phage binding: phage expressing antibody fragments are exposed to immobilized antigens which bind phage with antigen-specific antibodies. Washing: the phage-immobilized antigen complexes are washed to remove phage clones lacking antigen specific antibodies. Choosing the right washing times, detergent concentrations and buffer improves the selectivity for desirable antibodies. Elute bound antibody-phages from target: Common conditions that elute bound phages from target molecules are pH changes, reducing agents, enzymatic cleavage or elution by a competing molecule. .
Enrichment of Target antigen-binding clones: The eluted phage are then recovered by infection in bacterial cells. The recovered phage population is commonly amplified before the next round of selection, however, it may be used directly without amplification to reduce background problems caused by non-specific phages that are carried through the panning process. Usually there are 3 to 5 rounds of bio-panning. In most cases, the eluted phage are used to re-infect E.coli which are streaked on a plate to obtain individual colonies. A large number of single colonies are picked into 96-well plate to rescue the clones as phages. The phage are analyzed to identify positive clones amplified in bacterial cells and test binding activity using ELISA. Identification of selectants using DNA sequencing: The antibody expressed by a single bacterial colony is evaluated for specificity and reproducibility. If the antibody has the required functionality, the antibody gene is sequenced as part of antibody validation. 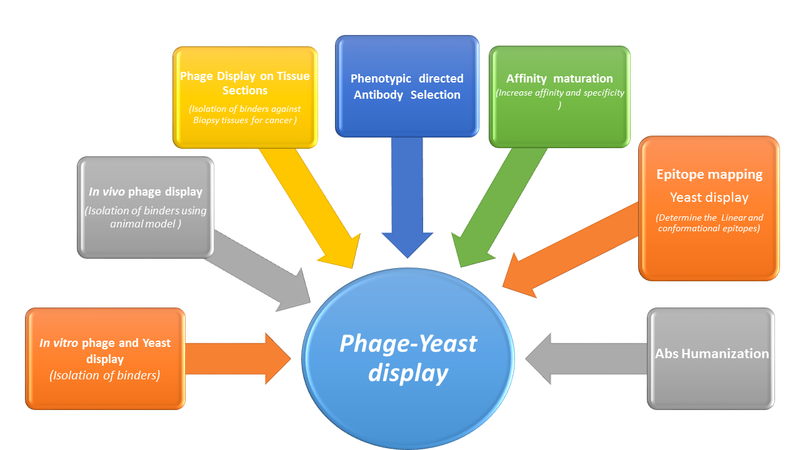 Schematic representation of phage and yeast display technologies applications for antibody discovery and engineering.